The BJP president Amit Shah attacked Rahul Gandhi’s comment of “dynasty” being a part of India and said it is only the tradition of the Congress. Shah condemned the “hate politics” being carried out in Kerala and planned protests in the state. Addressing the inaugural session of BJP national Executive meeting ” Shah also talked about Prime Minister Narendra Modi’s vision of ‘New India’. PM Modi is expected to highlight the achievements of his government during his speech later in the day”. In his inaugural address Shah said President Ram Nath Kovind, Vice President M Venkaiah Naidu and Prime Minister Narendra Modi had reached their position due to their work, despite their humble origins. However it was closed door meeting , but Union minister Piyush Goyal briefed the media about the speech. 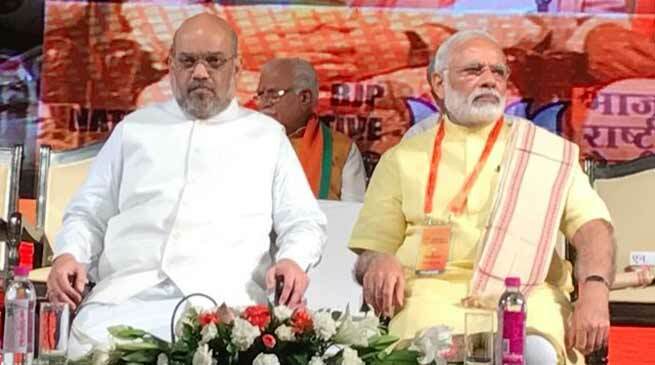 About 1,400 BJP MLAs, 337 MPs and all MLCs and its core group leaders from the states has attended the BJP national executive meeting on Monday at the Talkatora Stadium.